On February 22, 2018, Pope Francis released his message for the 2018 “World Youth Day” celebration (which is internationally celebrated on Palm Sunday, this year March 25). The theme of this year, which is aimed at all youth and young adults, is “Do not be afraid, Mary, for you have found favour with God” (Lk 1:30) . The document is available in various languages on the Vatican website. . . . 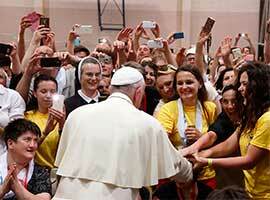 In the message, he references the Synod and the preparation for World Youth Day. This is the second of three year cycle of WYD themes focused around discernment, vocation, and the Blessed Mother (Lk 1:49, Lk 1:30, Lk. 1:38). Last year, the Holy Father asked young people to reflect on their past and how “the Almighty has done great things” for them. This year, the Holy Father is encouraging young people to be aware of the present moment – not to be frightened by it or by their own self-doubts, but to take courage and be open to accepting the Lord’s invitation to engage and to lead in church and in society. Three young adult delegates were discerned by the USCCB to represent the United States of America at the March 2018 Pre-Synod Gathering in Rome. The United States will participate in a special Pre-Synod Gathering in March 2018 in Rome, a milestone on the way to the Synod on Young People, the Faith, and Vocational Discernment. Br. Javier Hansen, FSC, originally from northern California, is a Brother of the Christian Schools in the Lasallian District of San Francisco-New Orleans, currently serving as a religion teacher at Cathedral High School-El Paso, Texas. Nick López, originally from San Antonio, currently serves as the director of campus ministry for the University of Dallas. He is also a guest columnist for the Catholic News Service column, In Light of Faith, focused on millennials. Katie Prejean McGrady, of the Diocese of Lake Charles in Louisiana, is a wife, new mother, youth minister, and a popular speaker who has been working with many youth and young adult communities across the country. In addition to the three delegates chosen by the USCCB to represent the parishes and dioceses of the United States, there will be other delegates at the Pre-Synod representing other groups (i.e. Eastern Rite Catholic Churches, various apostolates and movements) who live in the U.S. The bishops are grateful for all of their efforts and their willingness to serve as representatives on behalf of their peers. For more information about the Pre-Synod Gathering visit the 2018 Synod website. . .or read the Work Outline for the Pre-Synod Gathering. . . . In addition to the delegates at the Pre-Synod, the Holy See is inviting all youth and young adults to participate in sharing their input with Pope Francis through social media before and during the Pre-Synod Gathering. Please encourage young people in your area to participate online and via their mobile devices. Use the #hashtag, #TellItToFrancis, and invite the young people in your life to join the conversation and offer their thoughts and insights. For more information about this online dialogue opportunity read the invitation. . . for youth and young adults to participate via social media and check out the hashtags and questions. . . to begin your local conversation. Young people (ages 16-29) can also participate in the dialogue by joining a Pre-Synod Facebook group. A summary of responses from the Facebook groups will be included the drafting document of final conclusions that will be given to Pope Francis. The deadline to join is Friday, March 16th. Details for the English-speaking group can be found on the Synod website. SPECIAL SYNOD WEBSITE: The Vatican recently launched a website youth and young adults. . . related to the XV Ordinary Synod of Bishops on Young People, the Faith, and Vocational Discernment. WHAT IS A “YOUNG PERSON”? The 2018 Synod is focused around persons ages 16 to 29. In Italian, these young men and women are called “giovani” (and in Spanish, “jovenes”); in the United States, this phrase would most accurately translate to “youth and young adults” (or “young people”). In other English-speaking countries, the word “youth” is used; however, in the U.S., the term “youth” designates adolescents approximately ages 13 to 18, sometimes younger. The term “young adult” designates those in their late teens, 20s and 30s. Therefore, when speaking of the Synod and its focus in the USA, it is best to use the phrase “youth and young adults” (or “young people”) since the age-range includes both groups. The text of the “Synod Preparatory Document. . . “, including the questionnaire. . . for pastoral leaders, can be found online. . . .
Order Your Preparatory Document Today! The Synod of Bishops meets at the request of the Holy Father, when he considers it necessary or opportune to consult with the world’s bishops. A General Assembly of the Synod of Bishops is called “Extraordinary” when it is convened to deal with matters “which require a speedy solution” (Code of Canon Law. . . , cannon 346 §2) and which demand “immediate attention for the good of the entire Church” (OSE. . . , 4). January 2017: The Synod Preparatory Document. . . looks at the current global situation, the lives of young people in the modern world, and the process of walking with young people as they discern their personal “vocation of love.” The document ends with a questionnaire . 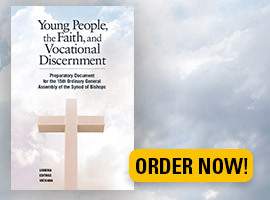 . . about young people and vocational discernment inviting responses that will be incorporated into a working document for the October 2018 synod. Pope Francis also released his Letter to Young People . . . in which he entrusted the Preparatory Document to young people as a “compass on this synodal journey”. Pope Francis tells young people “do not be afraid to listen to the Spirit” and encourages them to “undertake a journey of discernment to discover God’s plan” for their lives. Pope Francis’ letter encourages young people to let their voices be heard throughout the synodal journey and he ends by entrusting them to the Blessed Mother that she might guide them in responding “Here I am” to God’s call. April 2017: During Palm Sunday weekend, Pope Francis addressed the global community. . . of youth and young adults, and the ministry leaders accompanying them in Rome, connecting the journey of the Synod with the preparations for World Youth Day. He held a special prayer service dedicated to the Blessed Mother at which he spoke to the leaders and young people gathered in Rome. . . . On Palm Sunday, he entrusted the WYD Cross. . . to the young people of Panama. June 2017: The Vatican Synod Office launched a special website and survey. . .aimed directly at youth and young adults. The survey will help the Synod Office better understand the realities of young people today and their pathways to vocation and the Catholic faith. February 2018: Pre-Synod Work Outline, beginning draft. . .
March 2018: Pre-Synod Working Document, presented to Pope Francis by the young adults participating in the Pre-Synod Gathering on Palm Sunday, March 25, 2018. Spring/Summer 2018: Anticipated release of the Instrumentum Laboris (Working Document) for the Synod of Bishops, which will include input from the global consultations, online survey, and the Pre-Synod feedback. The upcoming Synod offers the Church a time to grow in understanding of youth and young adults.The National Dialogue. . . is an initiative dedicated to seeing an energized and unified Church committed to forming and engaging youth and young adults as missionary disciples. Through this three year process, the National Dialogue hopes to equip the Church with adequate ways to respond to the results of the Synod in order to create a more united community. Who are the “young people” of the Church? Although the United States defines “youth” as ages 12-18 and “young adult” as ages 18-39, the 15th Ordinary General Assembly of the Synod of Bishops will focus on ages 16-29, as defined in the Preparatory Document. The Synod on Young People, the Faith, and Vocational Discernment will be aimed at this particular age group and their pastoral needs. What does “vocation” mean in the context of this Synod? The Synod Preparatory Document speaks of the “vocation to love,” which “takes concrete form in everyday life through a series of choices, which find expression in the states of life (marriage, ordained ministry, consecrated life, etc. ), professions, forms of social and civil commitment, lifestyle, the management of time and money, etc.” In other words, the concept of “vocation” in this context is very broad. 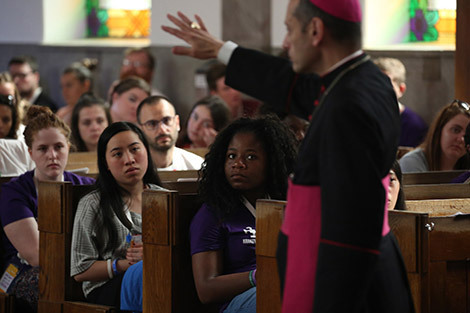 So when speaking of the states of life and the vocational journey of young people towards them, the U.S. bishops understand “vocation” to mean the pathway to marriage, ordained ministry, and consecrated life.Youth Ministry: Youth are defined as young people ages 12 to 18 in junior high school or high school. Youth Ministry is the Church’s pastoral action with this age group in parishes, grade schools and high schools, dioceses, movements, apostolates, and other ministry contexts. Young Adult Ministry: Young adults are defined as young people ages 19 to 39 who are single or married, divorced or widowed, and in college, working, unemployed, incarcerated, or in the military. Young Adult Ministry is the Church’s pastoral action with these age groups in parishes, college and university campuses, dioceses, movements, apostolates, and other ministry contexts. Pastoral Juvenil: In Hispanic-Latino cultures, “jovenes” are those young people ages approximately 16 to 30 (or until marriage), and Pastoral Juvenil Hispana is the Church’s pastoral action with these young men and women in parishes, schools, dioceses, movements, apostolates, and other ministry contexts.